Many people are unaware that there’s more options than aluminum gutters. A higher-end metal can provide many benefits. 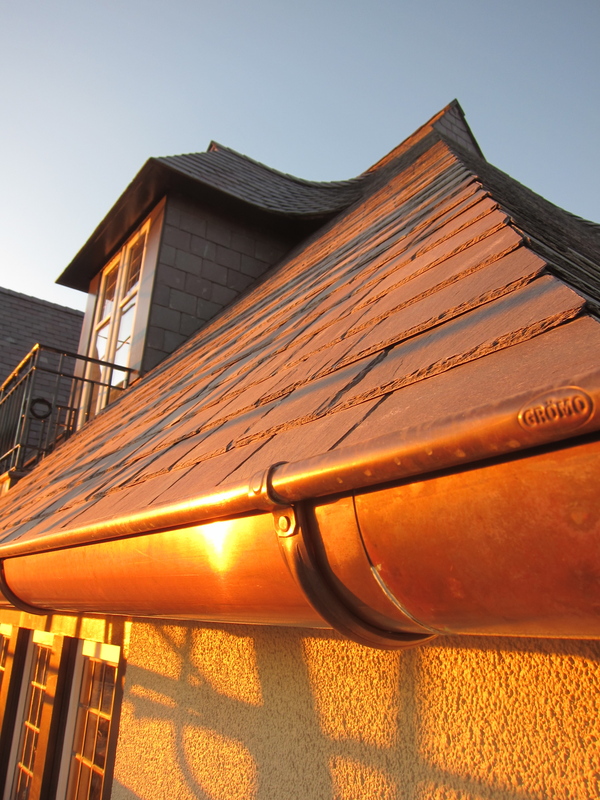 Copper gutters are one of the few installations on your home that retain their fiscal value. Copper is a precious investment of metal that protects your home. Our rain water system has seamless downspouts, which prevent moisture from accumulating. Seams allow water to pass even in small amounts, and the freezing of this moisture in could actually pry open holes in the system. A forward facing bead allow excessive rainfall to be directed away from the home, preventing the damage that other gutters fail to avoid. No one has copper gutters installed on their house and thinks, “Was this the right aesthetic choice?” The new gleam of the copper slowly fades to a dark brown, eventually tinting to its greenish patina. A thicker and sturdier metal, copper will retain its shape if installed properly and will be one of the last maintenance system that will fail a home. There are buildings built in the 1800s that still have their original copper rainwater systems. What types and sizes are available? Each home and its respective builder have individual, unique needs. We provide several options in order to cater to this. We actually have more than copper as an option. There are 3 types of Zinc available: natural, quartz, and anthra. Gutters come in 5″, 6″, and 7.6″ sizes to be used respectively with 3.1″, 4″, and 4.7″ with some overlap of compatibility. What makes the gutters unique? 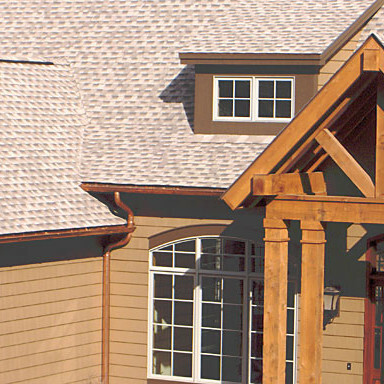 While made in America, our gutters are modeled after the European style. Imagine the common gutter you see on houses, a boxy shape. This is called K-style. European differs in that it has no hard edges but is shaped in circular fashion. Many gutter systems are caulked or crimped to close their downspouts. This can cause problems if there is clogging in the pipe, especially in the winter. In our downspouts, there is a subtle weld that makes the tube a single welded tube rather than a sheet wrapped upon itself. A well built home can last for several generations. Why install a system that would not stand the test of time. Aluminum gutters maybe last 20 years with constant maintenance. Copper and zinc gutters can survive 60+ years with minimum maintenance and well past 100 years if installed and inspected properly. Rather than corroding, copper builds a patina on its surface which protects it from the watery destruction that befalls other metals. Many gutter systems are painted because the metal has little value and does not have aesthetic value. Rare metals such as zinc and copper have a natural and surviving beauty, classy and charming. Like a fine wine, the copper gets better with age. As the years pass, the copper changes its color. These gutters need only a small amount of maintenance, especially the downspouts are seamless like ours. 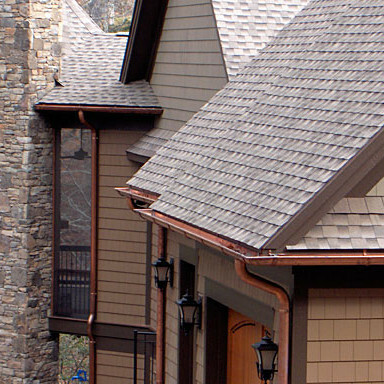 European-style gutters are shaped like a bowl to encourage the water away from the house by simple physics. Instead of faulty and deteriorating caulking, the copper in the systems is soldered. The metal, along with zinc, is recyclable, though you won’t be recycling it in your lifetime. This is a gutter installation on a residential home by one of our partners, Padgett Guttering. This is a EuroGutterUSA installation by CopperWorx, Inc., headquartered in Lakeland, FL. These were installed by one of our partners, Padgett Guttering. How Much Do Copper Gutters Cost Compared to Aluminum?